Science Minus Details: Experiments at Home #1 - "The Skillet Mystery"
In my ever-continuing quest to become an actual adult, I have recently begun to cook. I use a real oven and everything! In my usual encounter with the oven it takes just a few minutes of pre-heating before I realize that I have yet again left the big skillet inside. Panicked, I pull it out of the oven, and notice something weird! Finally I decided to repeat the skillet-in-the-oven experiment and document my findings. Here we go! Step #1--observe the condition of the skillet before its trip into the oven. Step #2--place the skillet in the oven. Conducting experiments gets me super psyched! Step #3--turn the oven temperature up to 350 degrees Fahrenheit and set the kitchen timer to 3 minutes. Note: experimental conditions chosen semi-arbitrarily. Step #4--remove the skillet from the oven and observe its condition. Observation #1: The skillet is cool to the touch. Observation #2: It's covered in water!!!! If you're not convinced, here is a before and after shot. 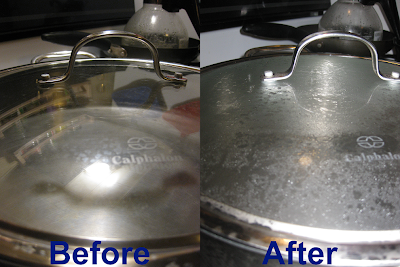 Water has clearly condensed on the pan after its 3 minute trip into the pre-heating oven. After a few times seeing this same thing, I finally stopped to ask myself, "Why in the hell is this skillet covered in water???" Got any guesses for what's going on? The same thing happens when any other hydrocarbon (gasoline, diesel, propane, etc) is burned. This is why you sometimes see water coming out of the exhaust pipe of cars. So the oven flame was producing water, but why does it coat the skillet? Well, after only 3 minutes in a pre-heating oven the skillet was still cool to the touch. So, when the water vapor from the hot hot flame came into contact with the cool skillet, it lost enough heat to turn back into liquid water. Kapow! Wet skillet! Mind you this is just my hypothesis, but I'm fairly certain its correct. Actually proving something in a scientifically rigorous manner is my day job and is painstaking work, so I prefer to spend my free time in "hypothesis wonderland." Welcome to my secret place! Any skeptics out there, feel free to offer alternative hypotheses (dragon juice? unicorn blood?). Related Post: Experiments at Home #2 - "Skillet Control Oven"
Ooooh, see, not all ovens do. In fact, some ovens (like every oven I've lived with) heat using an electric heating element. So this provides an easy way to test your hypothesis... repeat the experiment in an electric oven. I'll even give it a go for you if you lend me your skillet! 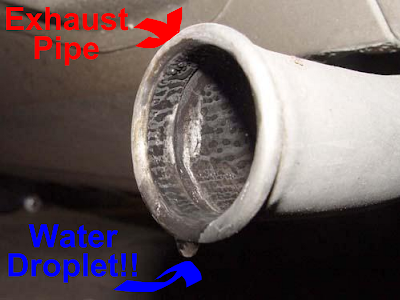 Water coming out of a car's tail pipe could also result from the displacement of water that condensed on the internals of the exhaust system during a period of nonoperation. The heat builds near the engine and propagates toward the tail pipe evaporating/condensing as it goes until it comes out of the tail pipe. Once it is sufficiently warm, all the water will be displaced and no water from combustion will condense. Any word on that follow up experiment using an electric oven? That's awesome. I never thought about the heat propagating through the system, just like when you heat up a distillation column! Wicked! I have an electric oven. And this never happens to me when I leave stuff in the oven. So I vote that your hypothesis is true.